Toast the hazelnuts in a wide based pan, for around five minutes, or until golden brown. Once toasted, chop them roughly. Place the mint, flat leaf parsley, basil, capers, anchovies lemon and garlic into your chopper (or use a hand blender if you haven't got one). Blitz until smooth. Put the mixture in a bowl, with the oil and around 3/4 of your hazelnuts and stir. Peel your carrots as normal and then use your peeler to peel the carrots into ribbons. 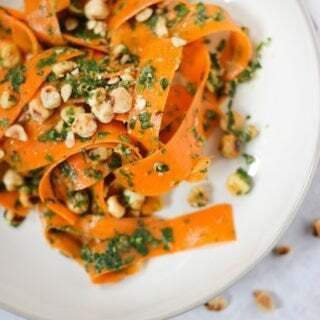 Put the carrots into a bowl with your herb mixture and hazelnuts and stir until well coated. Serve and top with the remaining hazelnuts.